It Is All Psychological – In The Mind! By Majid Al Suleimany « www.majidall.com – Being who you are and saying what you really feel! At The Workplace! – Outlook! A The Metaphor – A Bird in a Cage! The birds fly – because they know they can! Have you ever felt sometimes like a bird trapped in a cage? I do not know about you but I as a person do not like to keep or see birds kept in a cage! 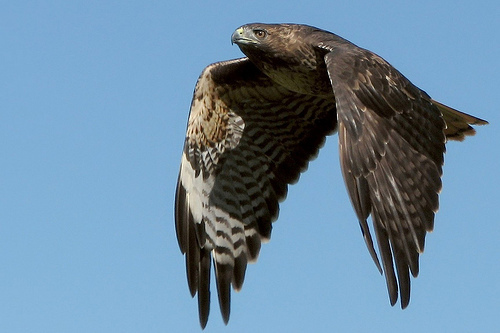 These beautiful smart creatures were meant to spread out their wings and fly – of course with the exception of birds like ostriches and others because ‘they are too heavy’ to be able to fly – though they can run very fast – or some even fly low ground in some stretches! If I were a bird I would definitely ask myself – Would I like all the food, water, attention and care but caged in – or would I prefer to take risks and challenges in my life – and be that bird free to fly out in the open world? The open skies? Be master of my own fate, destiny and legacy? A long time ago my twin daughter wanted to keep some – but a few days later on one of the birds had died. She wanted me to replace it – but when no one was looking – I opened and set free the other one still alive – because it was so distressed and hitting itself all around in the cage! Last week they went to Dubai – and left the ‘New caged birds’ with me. It was again very distressing for me! Once a friend showed me a bird that she owned which was locked up in a small cage. My friend told me that the bird was very “smart” and had tried on numerous occasions to break free from the cage. 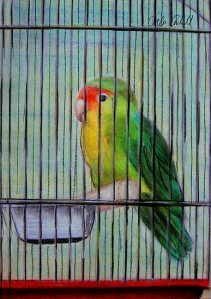 I looked at the colorful little bird as it tried to peck its way out of the bars of the cage. It fluttered about, shook its wings furiously. But to no avail! It was stuck there, and I listened to my friend – who went on and said that the bird had been intelligent enough to lift open the cage door – but as it was about to open it fully – she had caught it – and now she locked the door. I reminded my good friend that – Birds Were Created to Fly! Now, I do not spend so much of my attention on birds – but I suppose I looked at this poor bird and I really felt sorry for it. As it spread out its wings and tried to fly – it could not. It had been caged and trapped for a very long time in its life! Humans are a bit strange for wanting to cage up these beautiful smart birds in tight spaces. It has sometimes been asked of me – what kind of animal I would like to be – if I were one. The same question was asked to me by a good Indian friend – who believes in reincarnation. He had asked me – In your next life – what would you like to be M? The answer I usually give is that I would like to be an eagle and soar above the clouds – through the skies and look down on the earth. Unfortunately, this bird in the cage could not do that! It could not do what it instinctively and naturally born was made to do. It really was very strange. Sad too! I think there is a lesson here – even for us humans. Don’t you ever feel like you are a bird, trapped in a cage? You feel like you can soar above into the skies? You try as hard as you can to escape monotony, boredom and pain. Yet you feel like you keep ending up in your same cage? Fortunately, for humans – we actually have more freedom. We have choice. We have the ability to challenge and change our circumstances. Many of the “cages” of human existence are all in the mind. All mainly fear-based – and psychological! An Open Lesson for Our Leaders! B The Metaphor – The Chained Elephants! My good Indian friend N was telling me – that despite the great animal in the elephant’s intelligence and smartness – human beings are always able to control, dominate and manipulate their minds – with the exception of few rare cases – when the elephants run amok and wild! 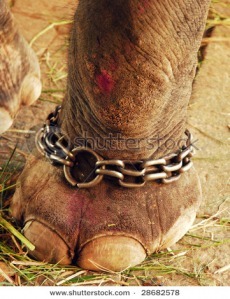 When the elephant is small – one of its feet is chained to a log. As the elephant gets bigger, the chain also gets bigger. A grown up elephant can easily break up the chain – if it really wanted to – but in its young mind – it has grown up to believe that it cannot do so! This sticks with the elephant’s mind in its maturity – and even in finally growing up! Entrepreneurs, social innovators and people wanting more passion in their lives should remember this truth: The limits upon you are only the limits that you place upon yourself. Only those that try can know how far out they can go! C Mice Simply Do Not Fly! 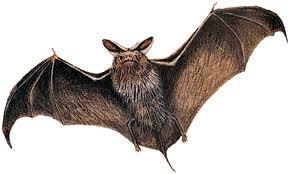 We have all heard of the story of the young bat who went to ask his mother – Am I a mouse or a bird? The Mother asked – Why dear son you ask? The son replied – When I fly with the other birds – they shout at me – get away from here! You are not a bird – you are a mouse! When I go to the mice – they run away from me – and are afraid of me! They tell me – you are a bird – get out of here! Who am I Mummy? The Mum replies – You are neither a bird nor a mouse! You are a bat! Do not forget that my son! Keep to your own kind only – the others will just not accept you – because you are different from all of them. Be proud of what you are – just a bat! A lesson to those of us that are deceived – or deceive ourselves – to belong to – where you are not simply wanted! Or even accepted! Or just being used – for a reason – and a purpose! Till too late – you learn the bitter real truth! Mice do not fly! Behind The Wheel! New Road Safety Book – Novel Type – Near Completion!